A few weeks ago I attended Fashion Revolution Edinburgh in association with Colour Elements, Tartan Brunette and The Edinburgh Centre for Carbon Innovation. This event brought together local makers to showcase their fashion brands as well as an opportunity to add their voice to the conversation on the future of ethical fashion. It opened my eyes to the fashion movement and just how much we, as designers, have a responsibility to support this movement. But how can we encourage sustainability in interior design? And although I keep referring to fashion, it’s these messages of production of fabrics and manufacturing that apply just as greatly to the interiors industry as they do to clothing. 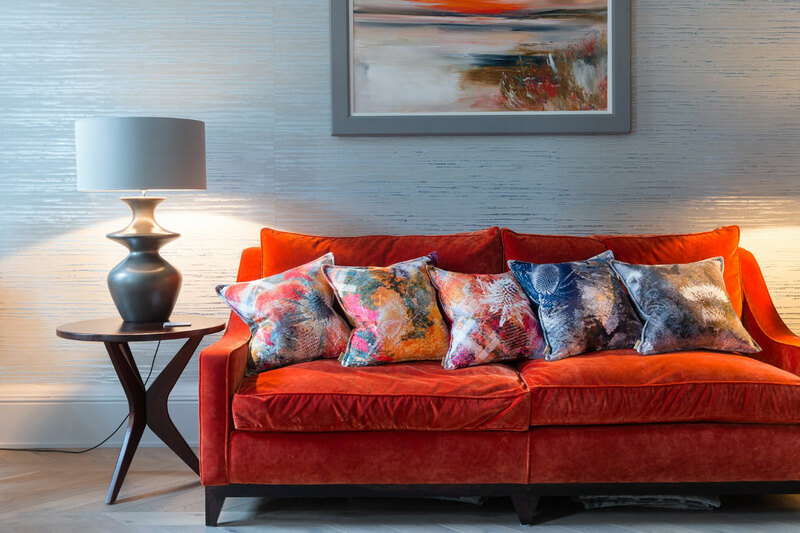 I strongly feel that we must all do our bit to help slow down this throwaway concept and increase awareness of sustainability in interior design. When you are designing your products how do you ensure that your brand has a lower environmental issue impact? All my Mairi Helena products are printed in the UK. This is something I have always felt extremely strongly about from the beginning. I work with local micro-manufacturers who also share the same ethics as I do. For example, Edinburgh based, zero-waste micro-manufacturer, Kalopsia Collective, is one of them. They have recently successfully smashed their Kickstart campaign, which is designed to help local designers to manufacturer and produce in a more sustainable way. What are your production processes and how do they encourage less disposable habits? Maintaining traditional methods is key to helping reduce carbon footprint. I combine digital print processes with traditional screen-printing for embellishment and details. I buy my fabrics for purpose and not for disposal, and ensure I apply a ‘zero-waste’ attitude. For example, offcuts are created into fashion accessories, one off garments or sample swatches. My fabrics are ordered to demand rather than stocked. What is your view on trends in interiors? I’m aware of trends but I don’t follow them. Instead, I allow my individual influences and inspirations to create my designs, designing a product which is fresh and full of personality. Never be afraid to carve your own vision! Through doing so, you will help to avoid the pitfall of short-term trend spikes and wasted production. How would you want to help in the future? After attending the Fashion Revolution in Edinburgh, I left feeling very positive that the future is bright and that we are becoming increasingly aware. We are becoming more curious, more environmentally conscious and most of all more responsible for our actions. It’s made me realise we must do more to educate our customers and the new generation of designers. Customer perception is definitely changing and people are demanding better quality! They want products to last. They are willing to pay more for longevity, for fabrics and garments that are designed well and manufactured to last. This has just as equal a status now to how trendy the product in question is. Alongside this it’s important to raise awareness to those campaigns and organisations that are supporting this movement. For example, ‘Campaign For Wool‘ championed by HRH The Prince of Wales. Wool is 100% biodegradable, natural, totally sustainable and environmentally friendly. Shop local, upcycle, recycle, buy better quality and do your bit for the environment. Lesson this nylon onslaught and make the world a happier place. P.S. If you are interested in sustainability Estila Edit 19 takes on this topic in more detail and highlights great British designers and brands, which are championing the slow movement. Credits: Text and photography by Mairi Helena. Please follow Mairi on Instagram.